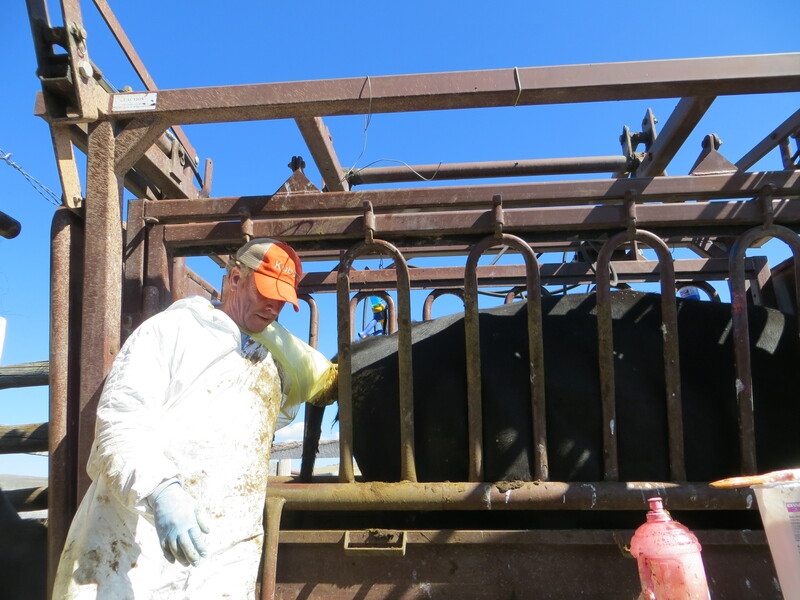 That time of year again… when the Good Doctor spends an entire day with his hand and arm being squeezed by the strong muscles of a cow’s ending digestive tract. That explains why his entire left side is green by the time he’s done. 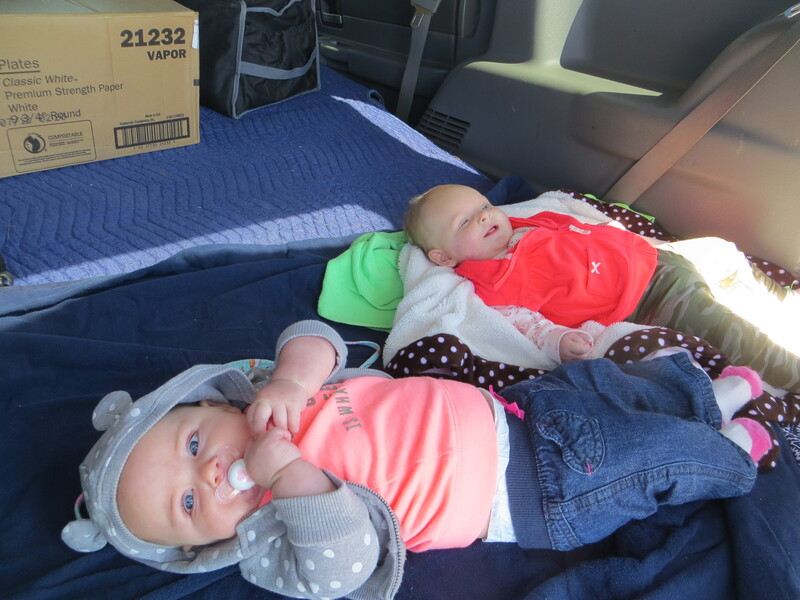 With their calves weaned already, there was much less bawling and moo-ing. That also meant no sorting to do… so… it was a pretty good day overall. We still didn’t make it off the hill until about 7 pm, but, hey, we didn’t have to break out any flashlights, and that’s a good thing! Our cows pregged out okay… Of course, there were some open, and some old, broken mouthed ones we culled… I loved this photo… Everyone’s taking a good look at this cow’s teeth! We were all there… plus a few neighbors… and although they’d LOVE to help… some of the crew *still* aren’t allowed close to the action! First of all I have to tell you I’m in love with this post. Not only are the pictures fantastic but I think this truly captures the life of most farmers. 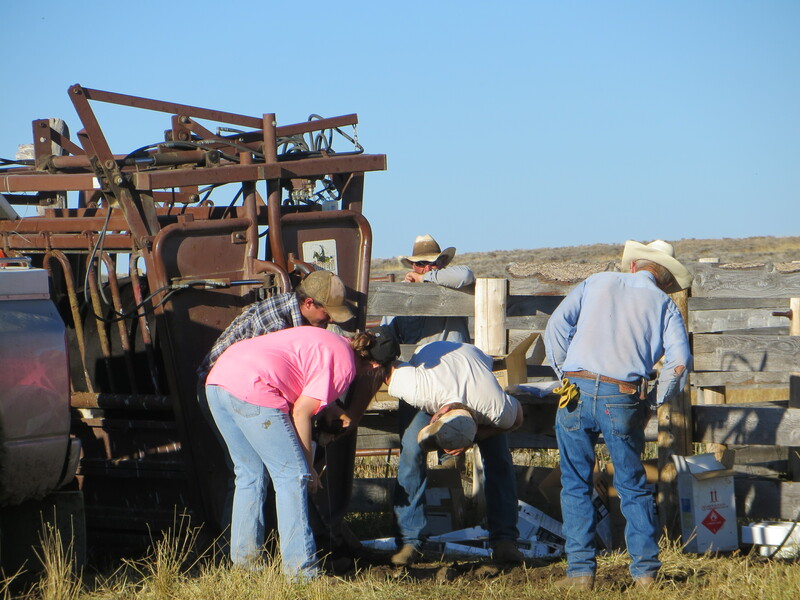 Unfortunately many people don’t realize that 97% of farms are family owned and operated. I really appreciate you not only sharing your story of pregnancy checking but how you incorporated your family and better yet how you expressed that your children were at a safe distance from all the action! I’m looking forward to more posts!!! Thanks for your kind words. Come by anytime! BABIES! Nothing cuter than chubby babies. I sure do miss having babies around. 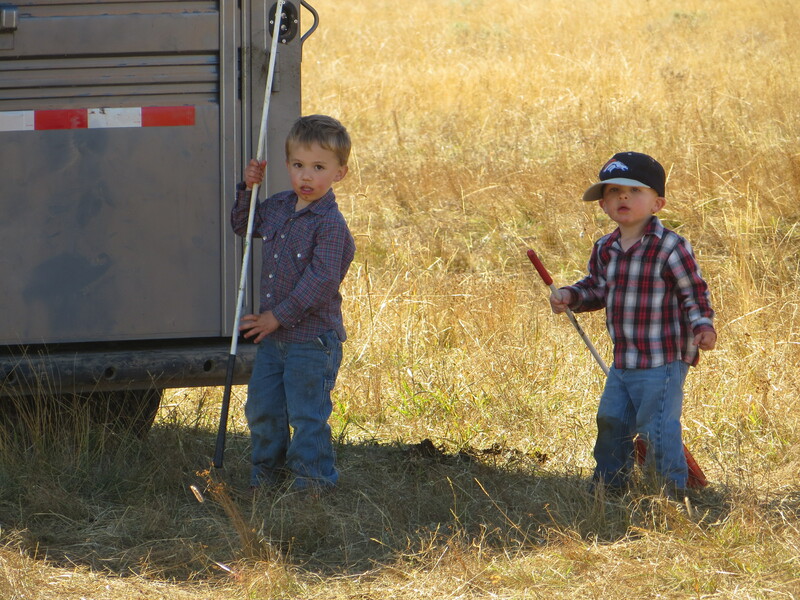 There sure are some good ranch hands coming up… adorable pics of the little ones…. Great shots! I especially love that you are all in shirt sleeves..we seem to find ourselves in layers and layers of cloths more times than not. Love your blog, Carol, you are a wonderful voice for ag! Great photos of the action Carol and wonderful ones of your Grandkids. What a blessing our GKs are to those of us alive to join in the fun of their lives. Sadly my Mom did not see my girls, so I’m making sure I save in my head as many memories as I can of my GKs. We’re needing lights on soon after 7pm now :-(. I’m sure there’s a joke or five I’m missing here. No, not really. Just didn’t explain things well enough, I guess!